Wayne Overbeck is no stranger to SCCCers. He has been contesting for 61 years! That's longer than some of us have been alive! His tower trailers have also been used for SCCC contesting (think XE2SI in the 1980s for example.) His web site is chalk full of contest and other good stuff. I asked Wayne to tell us a little about his VHF and up roving activities and was honored to get his story below. I've been on the air for 61 years now. 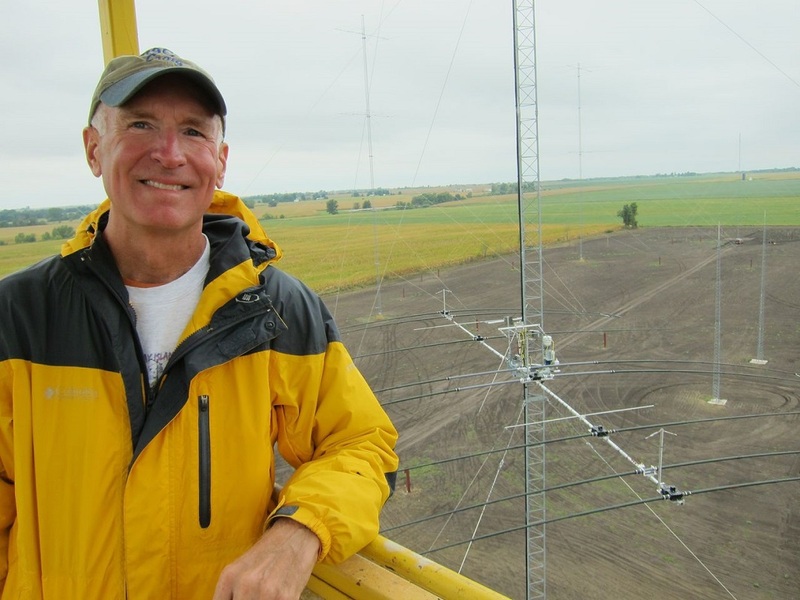 I've been operating VHF contests for almost that long, but I didn't manage to win a VHF contest nationally for a lot of years. 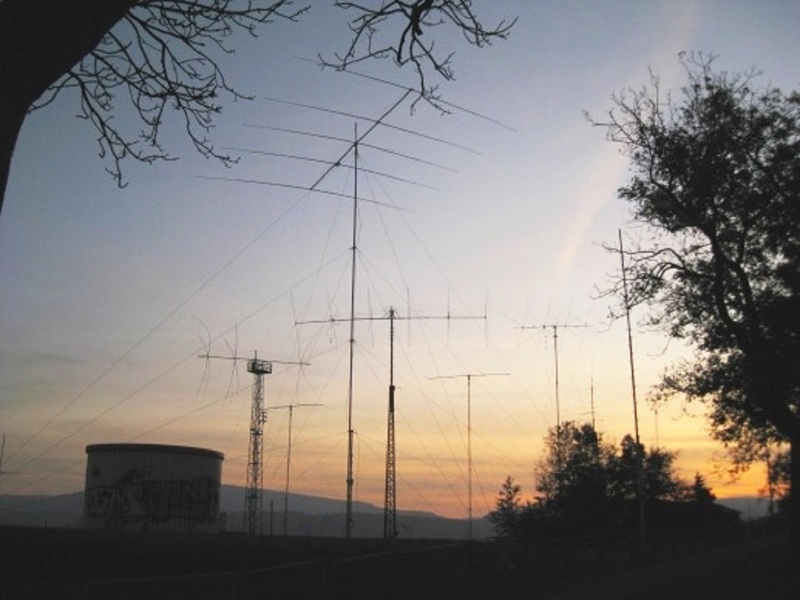 It's never been easy to be competitive in VHF contests in the west. I finally reached #1 in the single operator category in June, 1973. Then I was #1 in five June contests in a row (1973-1977). After a year with almost no sporadic E here but excellent E skip in the east in 1978, I took a van and tower trailer to the northeast in 1979. 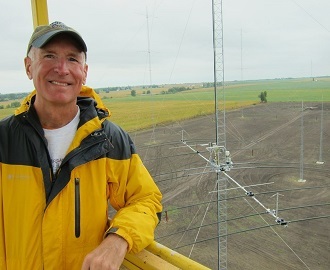 I ended up winning 12 VHF contests nationally as a single operator before ARRL section multipliers were replaced by grid square multipliers in 1984. In the grid square era, I operated mostly in the new rover and single operator portable categories. By now I've had the #1 rover score nationally in 23 VHF-UHF contests and seven #1 scores in SOP. Along the way I organized rover groups that had high enough scores to help SCCC win 13 gavels for the #1 medium club score in VHF contests. I also had the highest rover score nationally in the first two ARRL 222 and Up Distance Contests. However, my days of roving are just about over. Mobility is a problem now and my 10-band "toolbox" stations are getting heavier every year than they were the last time I lifted one onto a car rooftop. Maybe it's time for me to concentrate on cruising around on a mobility scooter when I want to go "roving." Thank you, Wayne. We hope you will consider continuing to rove, perhaps enlisting a partner to go with you. So, ten meters isn't open to anywhere. What to do? HF'ers will say, "Go lower", but I did the opposite. I went higher - much higher - to 10 gigahertz, a.k.a. the 3 cm band. 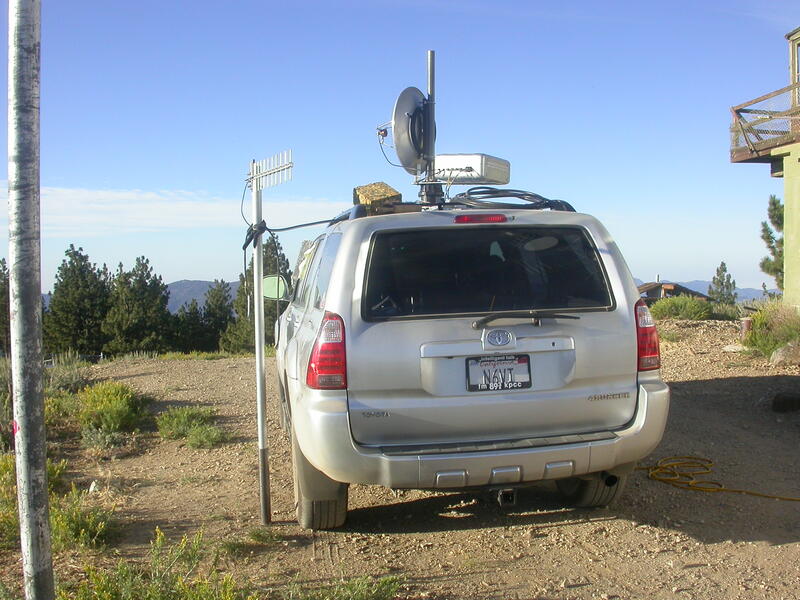 The first weekend in May is the 2 GHz & Up contest, sponsored by the San Bernardino Microwave Society, so I took a 24" dish with a 2-Watt transverter up to Frazier Peak and spent the day. Like its HF counterpart, conditions on 10 GHz were not very good this weekend, but I managed over two dozen contacts with distances up to nearly 600 km. Just as on HF, when conditions are not good enough for SSB, I went to CW for several of the more distant contacts, and that did the trick. Over the past several years, I have made X-band contacts into Nevada and Arizona as well as up to Mt. Shasta in Northern California with this same basic set-up. 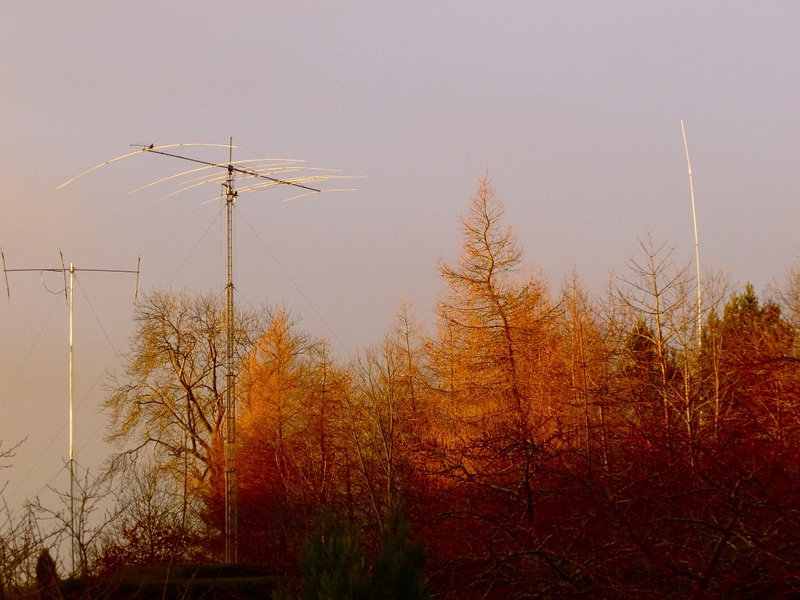 One recently announced operating award has raised the interest of HF'ers in (Maidenhead System) grid squares, but VHF / UHF / microwave have been chasing them for decades. This past weekend brought my 3 cm grid square total up to 19. Any of you who have had the opportunity to work with one of N6NB's loaner rover stations have had a taste of what the microwave bands can do. So, while you're waiting for sunspots to return . . . Even after five decades of contesting, there is always something new to try. My first attempt at remote operation turned out to be an amazing and unique adventure. My tale below is rather long - there were so many twists and turns. 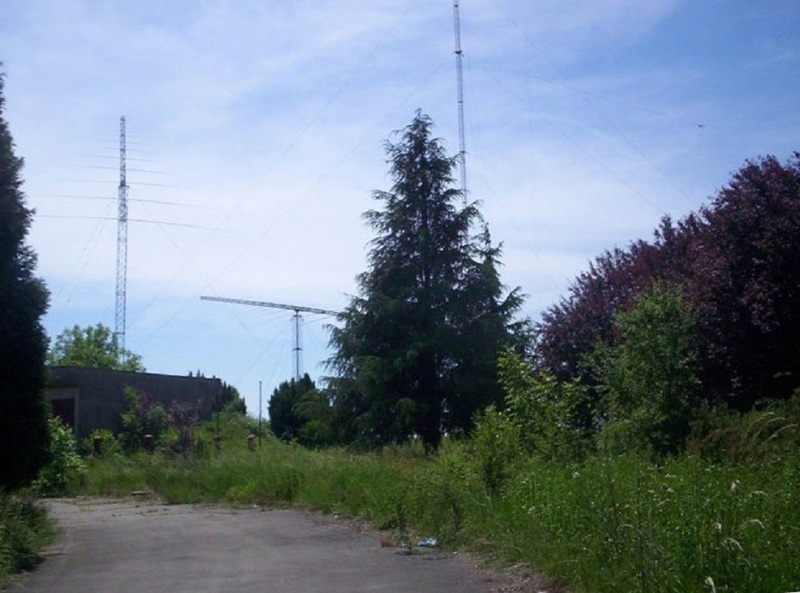 First a few words about HH2AA, a station that has been on the Remote Ham Radio (RHR) network for a few years. This is a proof of concept project supported by RHR in cooperation with the Radio Club of Haiti. 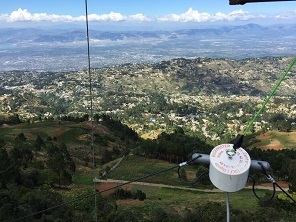 All proceeds from station rentals are returned to the people of Haiti through donations to the Haiti Air Ambulance Service organization - https://www.haitiairambulance.org. The station is a test platform used to try out off shore construction and operation techniques. 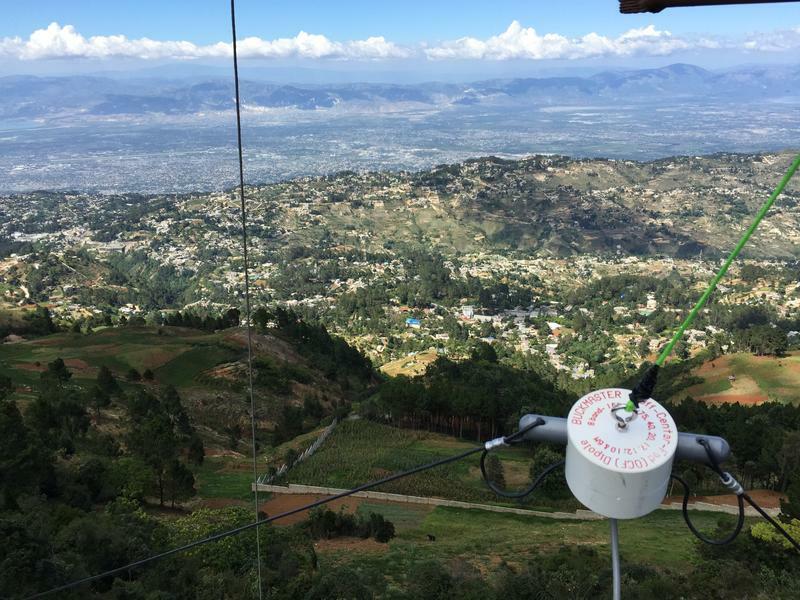 It is located on a mountain at 6,300 feet ASL near Port-au-Prince, Haiti, solar powered, and remotely controlled using proprietary RHR software. Station assets include an Elecraft K3 running up to 100w, a Cushcraft A3 tribander fixed NW (USA/JA), a Cushcraft A4 fixed NE (EU), and a 160M OCF wire antenna. 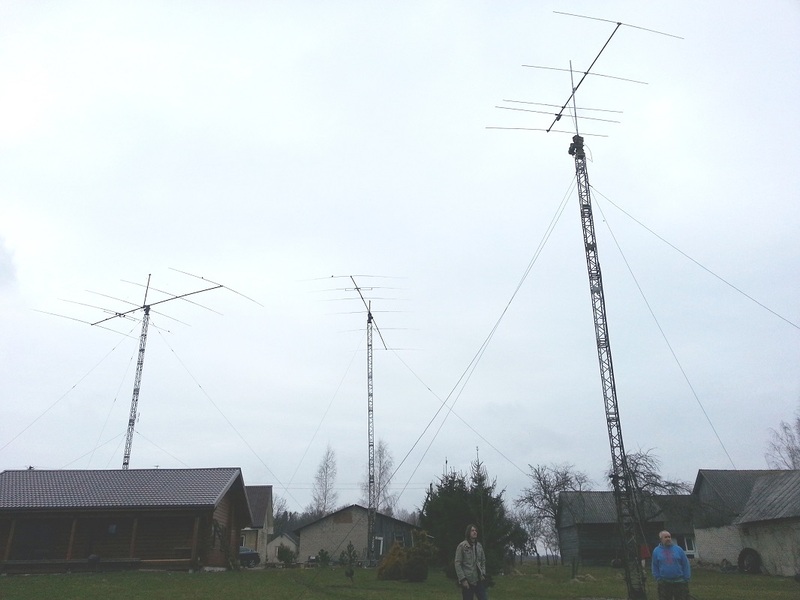 All antennas are mounted on a Rohn 45G 80 foot tower. A rotatable mulit-band antenna is planned in coming months. There is fiberoptic internet service to the site. All HH2AA contacts are uploaded to LOTW almost immediately and QSL cards can requested from NR6M. The grid square is FK38uk. I sincerely thank the owners of RHR for providing this unique opportunity to test drive HH2AA during the 2018 ARRL DX Phone contest. 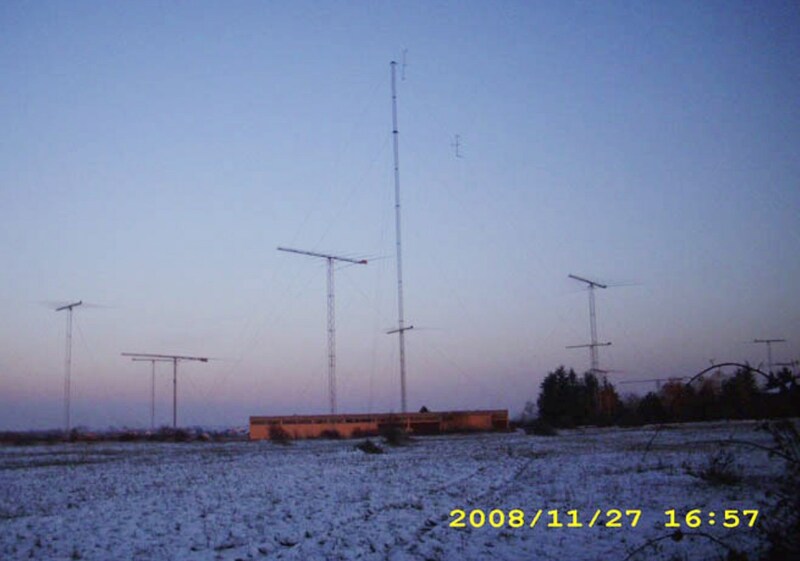 The original plan was to set the station up at the site of my own future 'remote' at KU2C/3 in Finland, PA. As you will read below adapting to rapidly changing circumstances can be an important part of this game we call contesting. 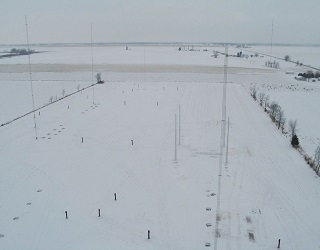 Tuesday 2/21 Received the green light from RHR to use HH2AA during the ARRLDX Phone Contest. Wednesday 2/22 Determined my 15 year old Dell laptop lacks the necessary horsepower to handle the task. 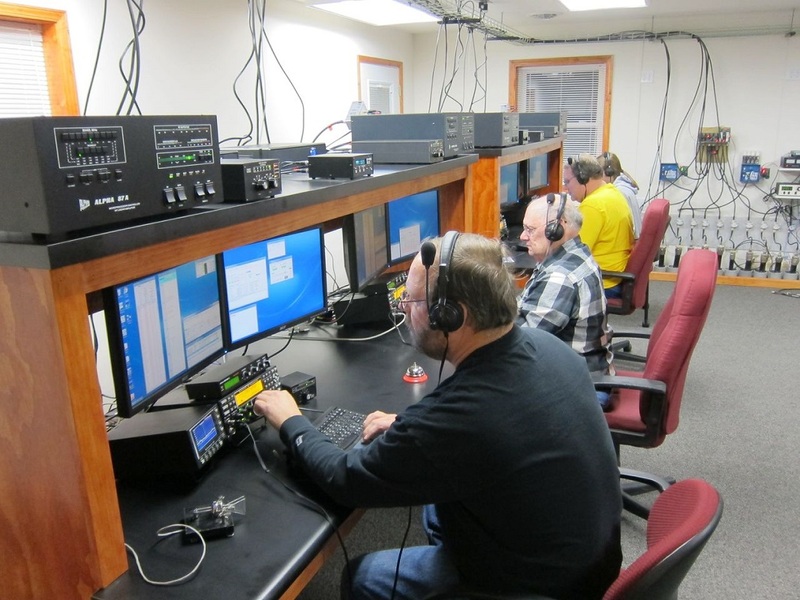 Tuesday 2/27 Lee, WW2DX at RHR and Pete, KU2C run proof of concept tests - everything works! Thursday 3/1 Set station up at KU2C's QTH using my K3S. Test several microphones. Dial in the VOX settings. Integrate Win-Test. Everything is ready to go! My K3S and Win-Test control the K3 at HH2AA perfectly. Make 100 contacts to get the feel for remote operation. Leave KU2C that evening feeling totally upbeat. Friday 3/2 10:30 a.m. Impact of a predicted major coastal storm begins to be felt by mid-morning. Snow and high winds start to make travel by automobile difficult. 3/2 11:59 a.m. KU2C sends a text to tell me he's lost commercial power due to downed trees. Estimated time to repair unknown (repairs were not made until late Sunday afternoon). Concurrently, while on the FRC Slack Chat Channel, developed a Plan B - I'll travel the 37 miles to KU2C, pick up station, and relocate to K3WW who has emergency power and internet. 3/2 2:30 p.m. Set off on the trek to KU2C/3 allowing several extra hours for possible travel difficulties. My projected ETA is 5 p.m.
3/2 5:35 p.m. Lee at RHR calls to tell me connectivity to HH2AA has been lost. It is a local Internet Service Provider (ISP) problem on Haiti. Tech will visit site in the morning. We discuss possible operation using another RHR site within FRC club territory until fate of HH2AA is known. 3/2 6:30 p.m. Have now been on the road for four hours and advanced just 25 miles. Have seen over a dozen cars and school buses off the road, many snapped utility poles, downed power lines, uprooted trees, experienced blizzard whiteout conditions, and most importantly have yet to find a plowed or treated road surface. Traffic is at a total standstill in the area of Perkesie, PA. Routes 313 and 113 are parking lots. 3/2 6:40 to 7:10 p.m. Take refuge in a restaurant and have dinner. Nothing is going well as you can tell. 3/2 7:15 p.m. Back on the road. Finally find a way to get beyond a major hill that has prevented me from reaching KU2C, only to be detoured again twice by downed trees and wires. 3/2 9:30 p.m. After seven hours finally reach KU2C in Finland, PA. We load the station into my car and I set off for K3WW. Immediately encounter another blocked road - tree down. Will this horror show ever end? 3/2 10:25 p.m. Reach K3WW. Driveway is blocked by nearly three feet of piled up snow. Call RHR. All NY stations are now off the network due to storm related problems (no power, no internet, etc.) Decide to drive home to NJ. You can't fight mother nature. 3/2 11:55 p.m. Arrive home after over 9+ hours of travel. Road conditions magically improved as I crossed the bridge between PA into NJ. Contemplate what to do in the morning. Saturday 3/3 9:00 a.m. Talk to Lee at RHR. Technician has been dispatched by ISP to diagnose problem. ETA on-site is unknown. No guarantee internet service will be restored. Consider going to the W2CG M2. Set the station up (laptop and K3) on the dining room table "just in case" connectivity is restored. 3/3 2:00 p.m. Lee calls from RHR. HH2AA is back up on the network. EUREKA! We run through the setup procedure and quickly discover the ISP technician had mistakenly reset a critical on-site RHR router that was configured to provide external rig control and logging program support. No way to resolve this problem until Monday. 3/3 2:20 p.m. The only option left - use the basic RHR functionality regularly available on their station control page which provides antenna selection, band and mode selection, PTT, basic frequency control and tuning, output power monitor, a beta version voice keyer, and a basic logging program. 3/3 2:22 p.m. I weight my options and immediately decide I'll go forward with the operation. Being DX is far more fun than being a W2 during this event. 3/3 2:29 p.m. Began operating on 21.420. Called CQ just once. Instant pileup - the power of being a needed multiplier is immediately demonstrated. It took a few hours to get comfortable operating without what over the years have become basic tools. I was probably bothered most by not having VOX. Have never been a foot switch guy and having to manually press the CTRL button (PTT) on thekeyboard for every transmission took some adjustment. The other thing I probably missed most was not being able to move between log entry fields by pressing the space bar key ... something I've done for over forty years using CT, NA, Win-Test and other loggers. It took several hours to automatically press the 'Tab' key after entering a call ... but it took concentration! Later on into the contest having to enter report data for EVERY contact (no report pre-fills after working a station on another band) became rather tedious. Being the only station active from Haiti certainly attracted a crowd. It's probably been a decade or more since I've had Aruba all to myself in a major contest. I knew what to expect and was prepared for the massive initial response. This was one of the reasons I decided to proceed with the operation even with a somewhat limited tool set... I'm a rate junkie at heart and the prospect of big pileups was terribly appealing! Needless to say I was not disappointed. The first five hours on 20M Saturday afternoon were consistent 150 hours ... the adrenaline rush was spectacular. Then as I transitioned to 40M and then 80M the pileups continued to be impressive considering I'm running just 100 watts to a 160M OCF wire through an auto tuner. It was heaven! The only serious shortcoming of the station is the noise from the solar inverter system which covers 160 meters with S9 garbage. The RHR guys think they have a fix but it will have to wait until their next visit. On CW this racket is less disruptive when using narrow filtering. Only K3WW made it through on Top Band in a 'move' QSO from 80M. I tuned a few times, thought I heard K3LR and W3LPL CQing, but never well enough to attempt a QSO. The Sunday morning sunrise run on 80 and then 40 was better than I had expected but then the morning doldrums set in. Both 20 and 15 opened to EU from the US which forced those of us to the south to take a back seat. The rate dropped like a rock - 20 an hour was the norm until about 1800 when the floodgates opened on 15M, yielding an exciting 177 hour - my best of the contest. I set up a cluster window on a 2nd laptop during the slow period Sunday morning and watched ten meter call outs all day. Never saw a single spot for the HI8 or KP4 guys so had low expectations for an opening but kept trying some CQs from time to time each hour. There simply was never propagation from HH to the US - disappointing to say the least. So what about the internet latency issue? To tell you the truth it was rarely noticeable. At times the internet would burp or my laptop would become over burdened and slow down, but this never stopped me from making contacts. Sometimes I'd simply hit a key that I shouldn't have on the keyboard and I'd end up disconnected and would need to restart. But in general, I found remote operation very easy and not all that different than the real thing. Using PTT, I had to be somewhat careful not to let up on the CTRL button too soon, otherwise the final "A" in HH2AA would get cut off (suspect if I had VOX working correctly this would have been a non-issue). No one complained that my audio was unintelligible at any point. And probably most important of all I felt LOUD most of the time. The HH2AA location is a winner. When the bell rang at 2359 UTC I had absolutely no idea how I'd done in my 23 hours of on time. The RHR logger doesn't have a contact counter so the total number of QSOs logged was unknown. Monday morning Lee at RHR sent me a file of ADIF contact records. It was apparent there were almost 2,500 contacts but work was needed to create a log in valid Cabrillo format. During the contest I'd mistakenly entered report data in the wrong log entry field for about 400 contacts near the start, and without an edit check, throughout the weekend at least 50 section abbreviations were entered wrong but still accepted. These are minor things really, but time consuming to fix manually. I used a freeware converter to migrate from ADIF to Cabrillo format records. Fellow FRCer KE2D helped me correct some record format errors. Finally by late Monday evening, (early Tuesday morning), I had a log file I could load on Win-Test and obtain statistics. As expected 20M was my big band but I was impressed by the 40 meter multiplier total given the limited time spent there. I can't help but wonder what the score could have been if the original setup that had worked so well Thursday afternoon were available all weekend. Bottom line, to me the HH2AA remote operation was an unqualified success despite the 19 hour delayed start and not having basic accessories. I'd love to do it again. Thanks RHR for this opportunity and for your first class support every step of the way! 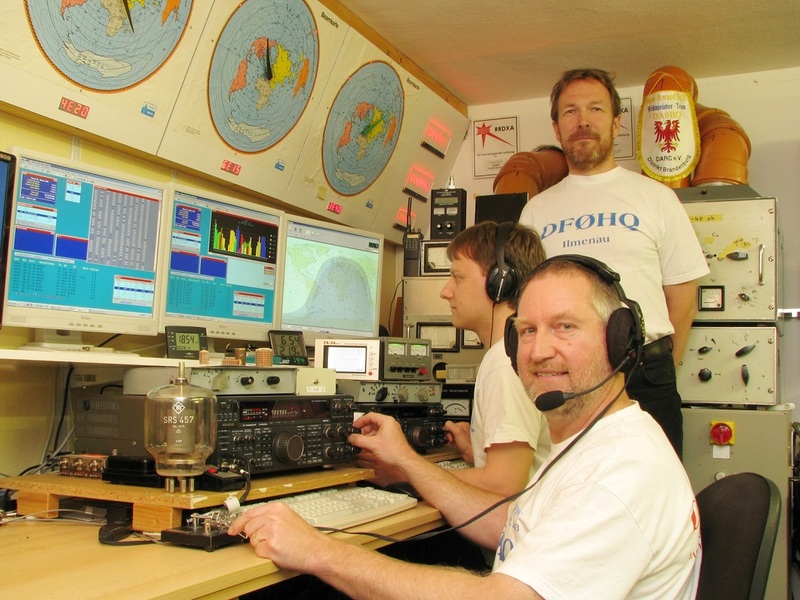 Our club was founded in 1994, with assigned call SP9YDX. Responsible operators at that time were Jan SP9EIJ, Alek SP9NLK i Roman SP9FOW. Right now after a few changes the list of responsible operators is as follows: Peter SP9QMP, Woj SP9PT, Zygi SP9IJU. The exact location is within the small town of Rydultowy in close proximity to the border with OK and OM. 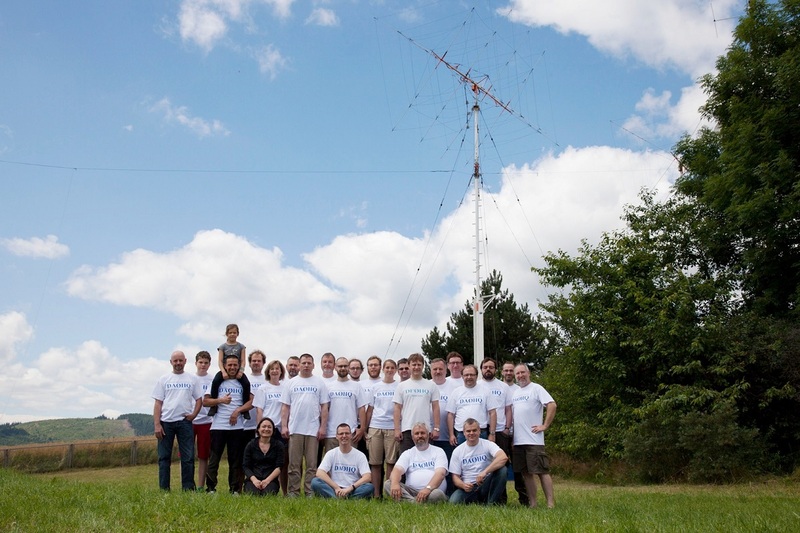 Our club is hosted at Auto Service PTA Sanecznik – car service owned by Peter SP9QMP, where all the antennas and shack are located. 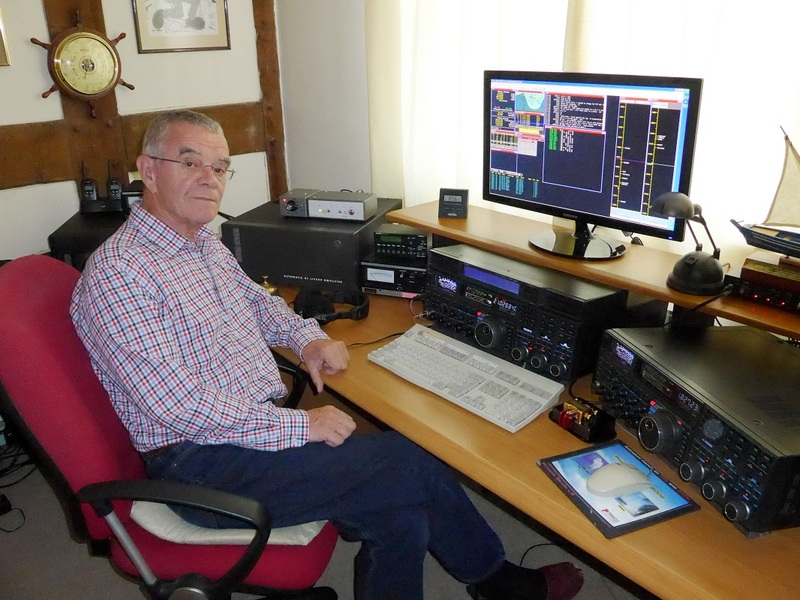 Peter SP9QMP is a well known polish dx`er and he is also a president of the SO9Q club. The number of people involved is constantly changing. 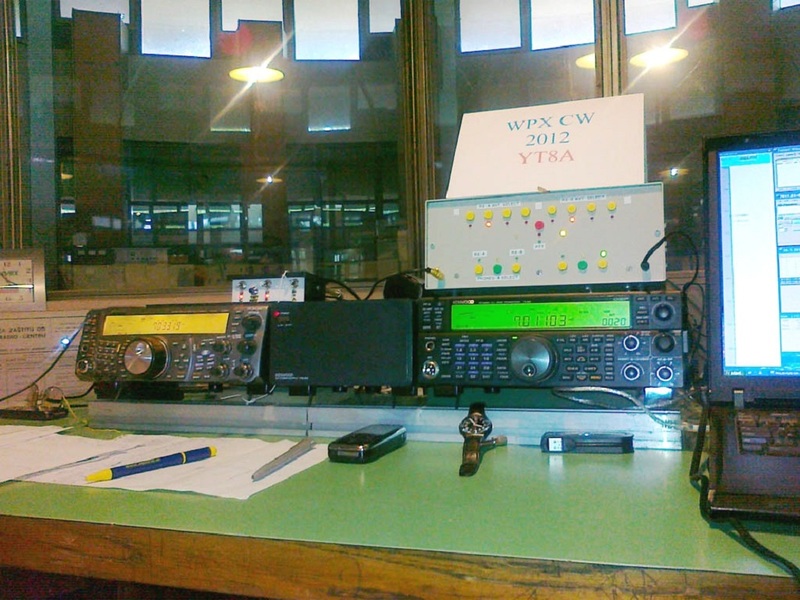 During many years of activity we had (and we still have with some of them) pleasure to cooperate with the following operators: Andy PA4A, Donata (yl) SP5HNK, Tom SP7UWL, Roman SP9FOW, Kaz SP9GFI, Edward SP9H, Zygi SP9IJU, Woj SP9PT, Peter SP9QMP, Tom SP9QZT, Stan SP9XCN, Maciek SQ6MS, Tom SQ9C, Chris SQ9DXN, Greg SQ9E, Gen SQ9HZM, Wojtek SQ9JKW, Ralf SQ9LR, Henry SQ9MZ, Adam SQ9S (ex SQ9JKS), Alex SQ9UM. 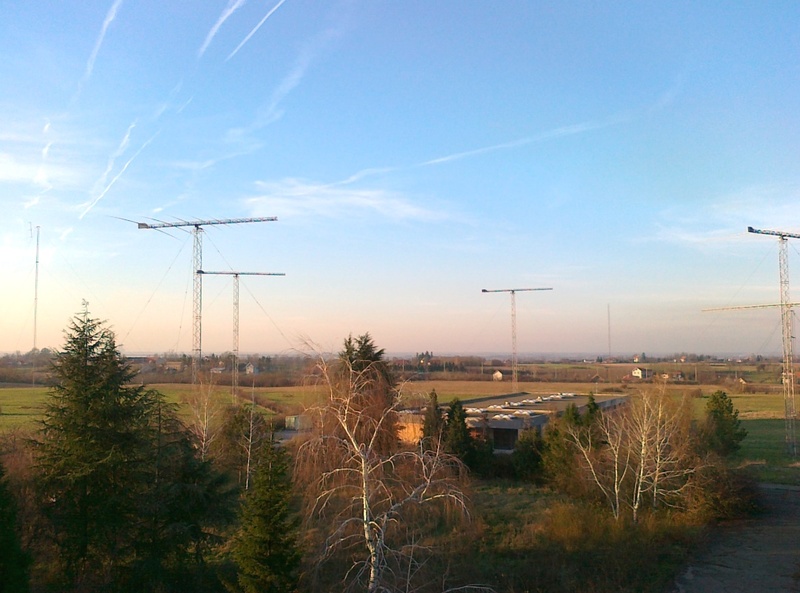 The YAGI antennas were designed and built by ABIS Antennas; Jerzy Smoczyk SP3GEM company. 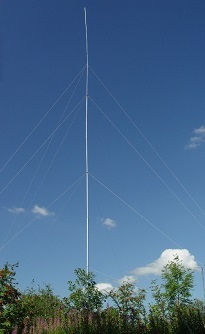 For 160 and 80m transmitting we use a 21m tall vertical with elevated radials and a full sized 160m Inverted vee dipole. For low band RX we use beverages and a 4 square array of single k9ay antennas. For logging purposes we use WIN-TEST software in a small network of 3 PC`s linked together through a local area network. The most recent and important antenna project is to modify the existing low band antennas used for transmit. More complex electronic repairs are made by Jozef SP9HVW who is an expert in that matter. Since 2012, as new rules for WPX and ARRL MULTI OP categories arrives, we find Multi Two entries more suitable for us. This is because the limitation of band change rules does not promote activity on more than one radio at any given time. As a result we cannot use our stations full potential. As an addition to the scores listed above, several times we have reached the top position in our domestic contest station competition called INTERCONTEST HF. 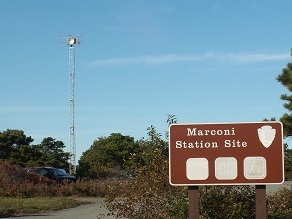 The K9CT Contest Station was created as a project and challenge for myself. The spark that lead to this was the compromises of living in close quarters to my neighbors and finding out what could be done to get to the next level in contesting. My curiosity of all of the technologies and designs that could be implemented whet my appetite for the project. 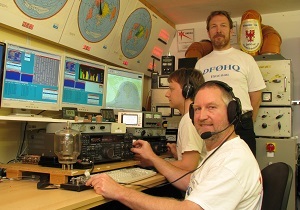 But most of all, the camaraderie of the dxpedition team environment lead me to the multi-operator contesting setup. The site was prepared as it had drainage issues, buried tires and buildings in disrepair to be demolished. While this was being completed, I visited several contesters to learn from them about many aspects of team contesting, station layout and antenna usage. This was a tremendous help. I was perplexed very early as to the many options for designing and laying out the contest station. From previous experience with our building permit process, I had contacted the zoning department for our local county and inquired as to the proper zoning to be able to have the best possible path to building permit. The zoning was for Agriculture and was the most open to any type of structure. However after submission of the permit request, I met with resistance from the public because the county wanted to go through a hearing process. Shortcutting the story, I secured the services of K1VR, Fred Hopengarten and we withdrew our original request and resubmitted a request for permit without the hearing process. The legal department for the county reviewed our application and directed our county building department to issue the permit. We then had one year to complete the 11 tower project. With the permit in hand, I secured the services of John, W2GD and Don, K4ZA to consult and erect the towers and antennas. 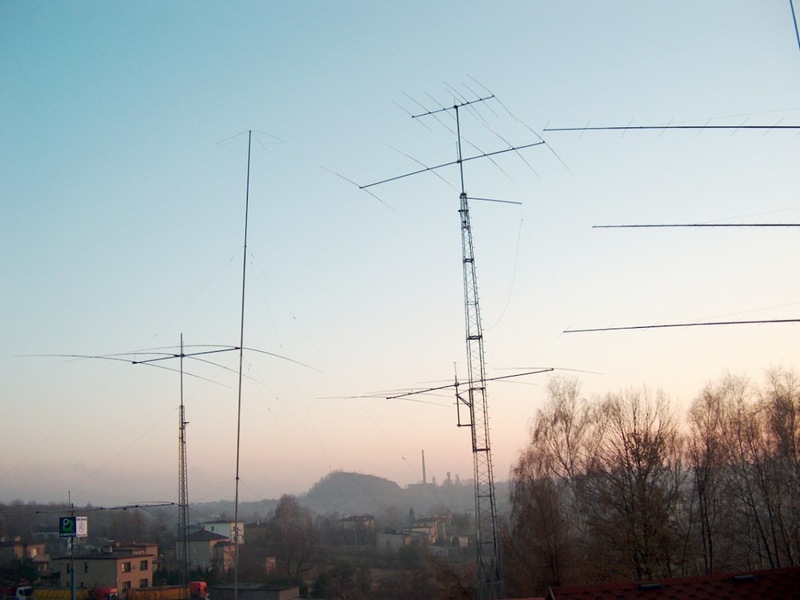 A three stack of monoband OWA yagis were selected for 10, 15 and 20 meters, and a two stack for 40 meters. 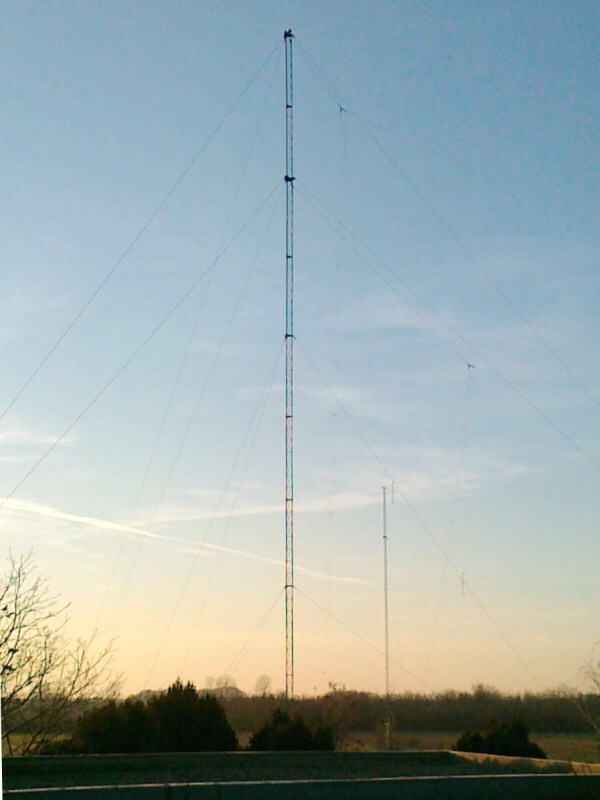 Using HFTA, towers were to be 190 feet for the 40 and 20 meter stacks and 150 feet for the 15 and 10 meter stacks. 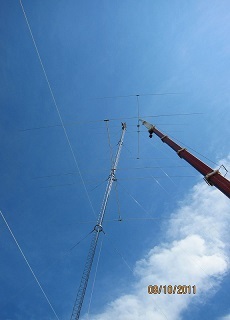 The towers were rotated with K0XG base rotators and hardware. I chose to use elevated guys for farming the land so the professional engineering services of Hank Lonberg, KR7X were contracted. We worked together to choose the tower locations and he did the calculations for wind loading with ice on the tower and antennas. 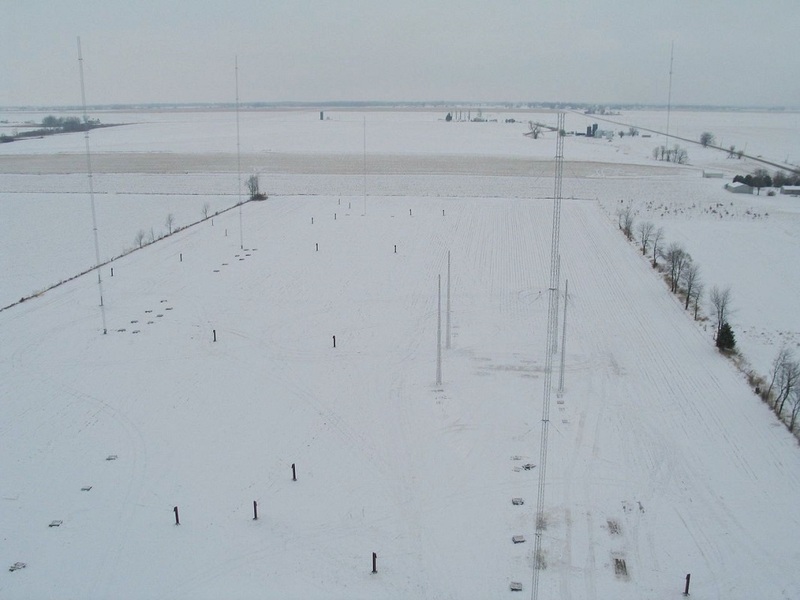 I chose to put the low band antennas further away from the shack and the higher frequency antennas nearer the station to minimize feed line loss. 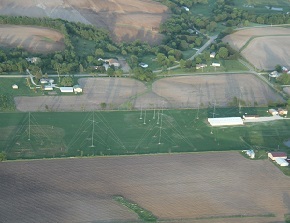 1⅝” Heliax was searched and acquired to trench to each tower for a low loss feed line. 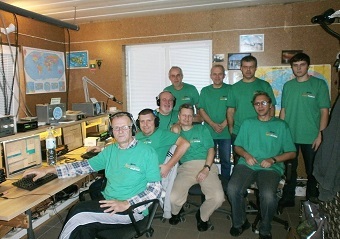 The project commenced right after the PJ7E activation. Most material had been secured and we tackled the project with lots of manpower and machinery. All foundations were dug and rebar prepared...cement was poured within 7 days! 125 plus cubic yards of concrete was in the ground. The tower was preassembled on the ground shortly thereafter. The longest pieces were 100 feet and then laid on pallets to keep off the ground. The cement cured for thirty days and we were ready to install the towers. Cold weather hit hard on the day we wanted to commence the crane work. The crane froze before we could get started! 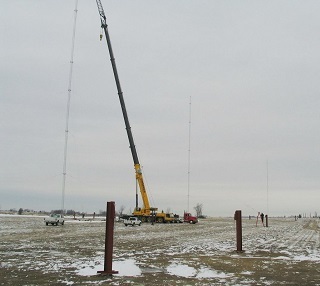 A new crane arrived the next day and within four days we had all towers up and guyed! It was still cold and we even had some snow while doing this work but the crews battled through it and towers glistened in the morning sun upon completion. 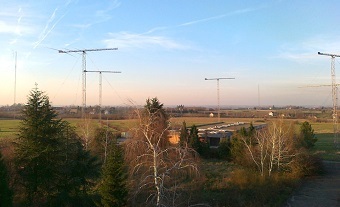 Over the winter, antennas were being assembled and fabricated. 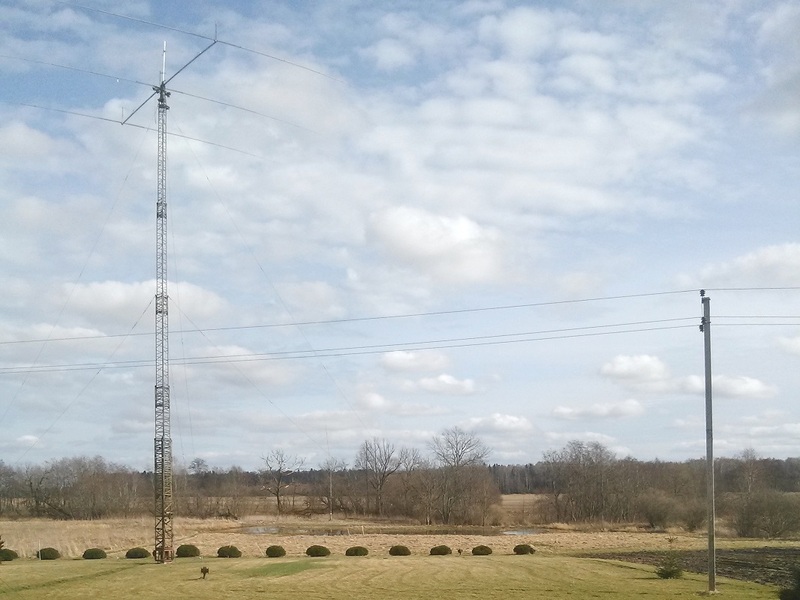 The VHF antennas were completed the first nice spring day and the EME antennas and frame were carefully assembled for many days in a row. The OWA antennas arrived the day before 2011 Dayton Hamvention. Much work to do after that! A large trench was dug from the soon to be built shack to the mult-tower using a backhoe. The rest of the coax was trenched to all of the tower locations. 9400 feet of 1⅝” was buried along with almost 1900 feet of 1¼”. Power and rotator control cables were also direct buried. Many saw horses were secured from the local building supply stores and placed throughout the 18 acres so that the 60 foot boom OWAs could be assembled next to each tower. The crane could then easily move to each tower and then lift the antennas to the tower climbers. 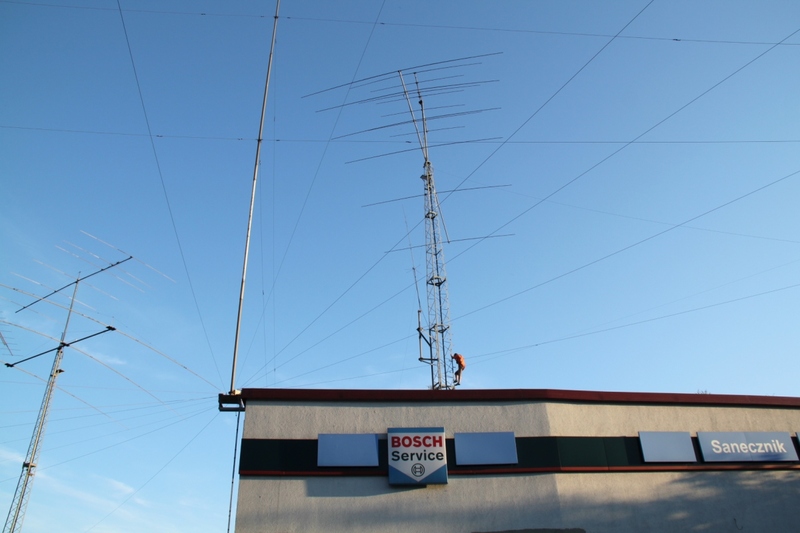 All antennas were in place in less than a week’s time using this method. 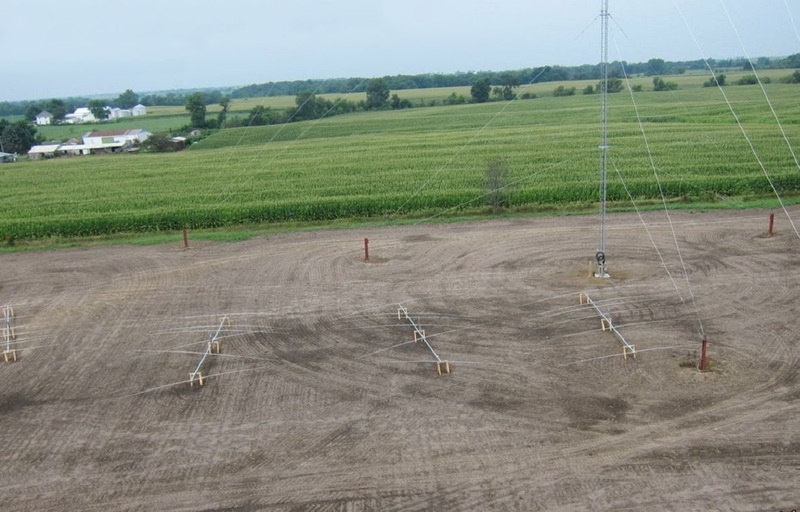 The Stackmatches were mounted at the base of each tower and ½” Heliax were installed to each antenna….carefully wrapping the excess lines on the tower for a nice appearance. 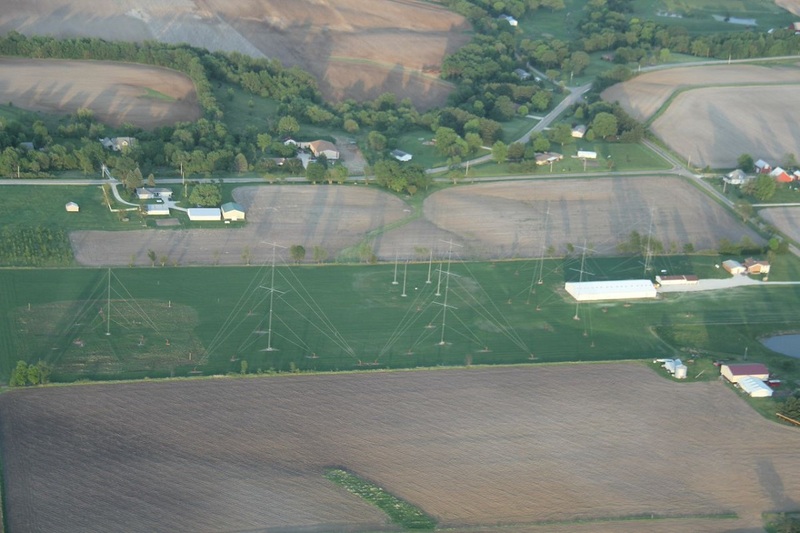 All summer we plowed in thousands of feet of THHN wire at base of the 80m 4 square and the 160m 5 element array. The farmer had prepped the soil at each location so that they were weedless and evenly bared soil. Wherever the radials met, they were silver soldered to a common copper buss wire. 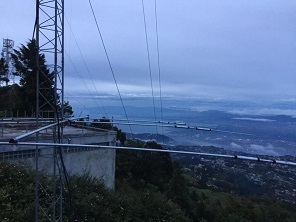 Every tower had several ground rods installed and attached to the base with copper buss wire and Cadwelded. 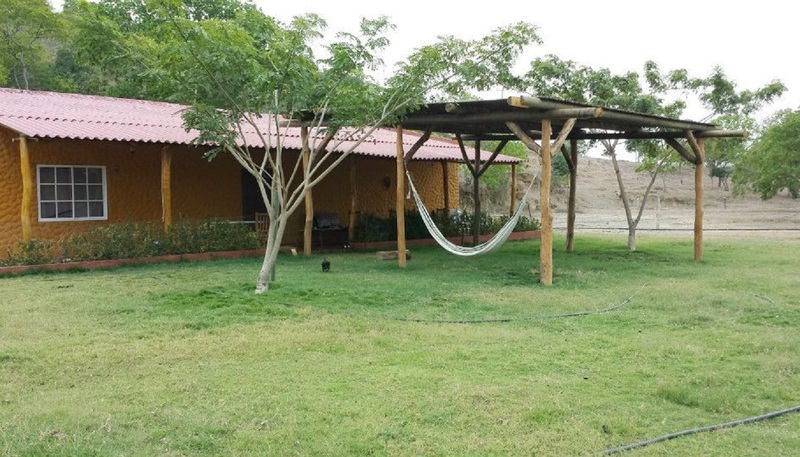 Simultaneous to the activities in the field, a new building was designed and constructed for Multi-two station operation. An open room was provided for the operators and contesting. Adjacent to that the bathroom with urinal for the quick trips needed in the middle of a contest! A shower and bunk room next to that and more isolated was a break room with small kitchen and dining area. All of the walls were insulated for noise isolation and a good door to the shack area could be closed for sleeping or when the conversation was a bit loud in the break area. A garage and workshop were located at the far end of the building. 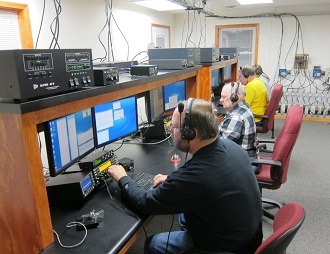 The building was completed in time for us to setup on tables for the CQ WW Phone as a M/S. 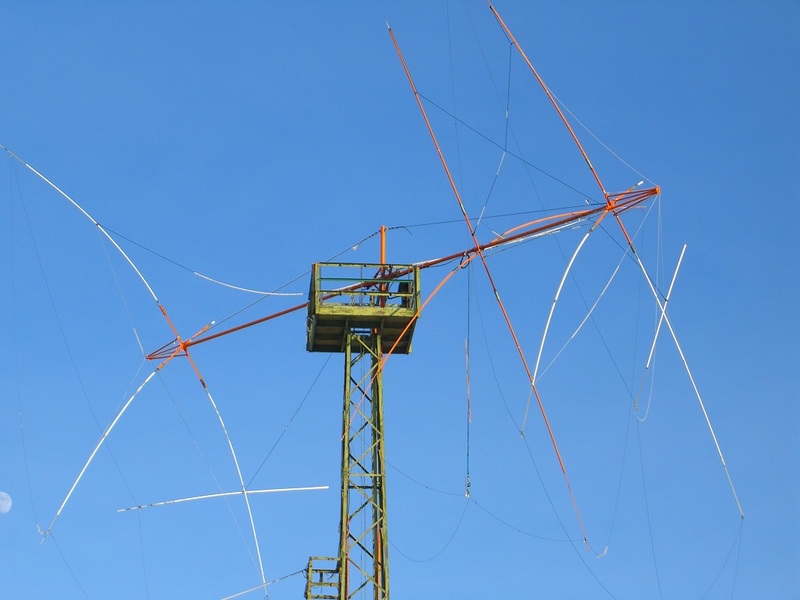 Towers were still manually rotated in the field and nothing was automatic in the shack….it was more a Field Day operation but still much fun to try out the antennas in a contest. Work progressed rapidly following the first contest. Station consoles were designed so that two operators could sit side by side with plenty of room for each to have two flat screen monitors. Comfortable chairs were tried over many contests and finally selected for best comfort for long hours of operating. Station was carefully designed for best operator ergonomics. Eyes on monitors and hands on the keyboard. I decided to minimize wiring and get as much done with wireless using Green Heron Everywhere and WiFi network. I setup a server to connect to the rotators, Stackmatches, and Steppir controllers. Each radio position computer was a client to the served devices. Any band change would select the correct antenna, filter and on screen rotator and stackmatch. N1MM uses UDP on the network for band information. Green Heron and PSTRotatorAZ use these packets to make band changes. Presets were created for the main population areas for contests. Green Heron EK devices are used to rotate the receiving and transmitting antennas for the low bands. Wireless keyboard and mouse are used to eliminate EMI to the computers. We have three years of contest seasons under our belt now. We have a solid team for our contests with only a few new operators needed to fill in when the regulars could not play. Refinements have been made to improve ergonomics and some technical issues that have emerged. Lightning has hit a couple of times in the area and repairs were needed. Learning from these experiences, tweaks to the installation and programming have been implemented. How has the station played? We have broken most of the W9 or CQ Zone 4 records in our category for CQ WW, WPX and ARRL DX. Our Reverse Beacon Signal reports have been equal or better than our peers. Timing is everything…we have broken the USA WPX record from the Black Hole! 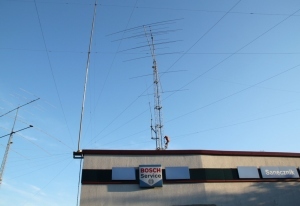 (also so did our east coast competition) I have operated the station a few times in domestic contests and found that most of the antennas are too high or narrow in pattern. 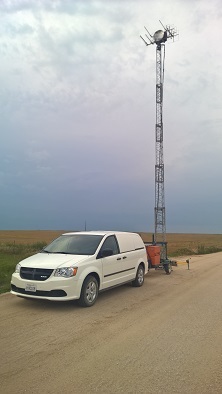 I have added a few low dipoles and setup a portable to tower to fill the void. My plan is to add a crankup tower with the proper antenna to solve this issue. 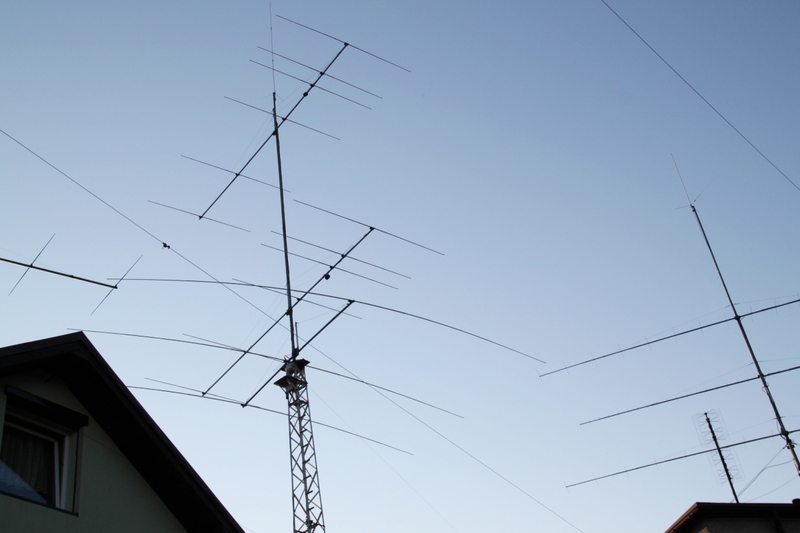 A 3 element yagi for 80m still awaits the right tower. This has been a fun project. I now have a ham radio “man cave” to find escape any day I can. My team mates for these big contest weekends enjoy the team spirit and pleasant environment as well as I do. Many clubs and hams have stopped by for the “tour”…visitors from several countries have made stop….some for entire weekends. The contest club station DF0HQ is located on a small hill (550m asl.) in Ilmenau, Thuringia, Germany, JO50LQ. 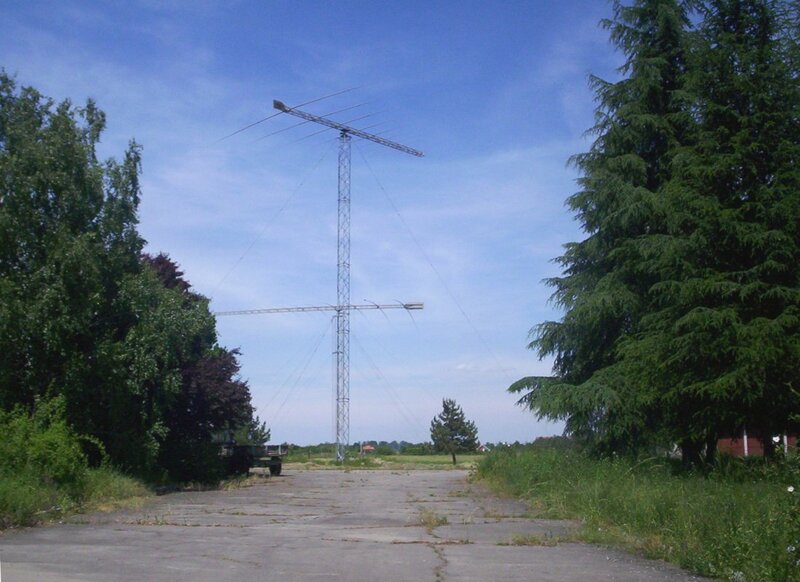 The first activity at this QTH started in 1970 setting up a 3 band cubical quad antenna using the famous call Y34K. This is our favorite antenna type up to now. Over the years five different quad antennas were designed using EZNEC and covering the bands from 40m to 10m. For the low bands we use loops, ground planes and Beverages in five directions. 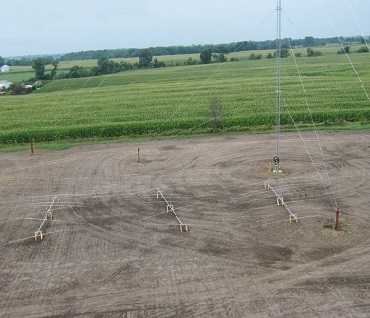 The rigs are mostly Kenwood TS 950 and 850 installed in 6 places for 6 Bands operating at the same time. 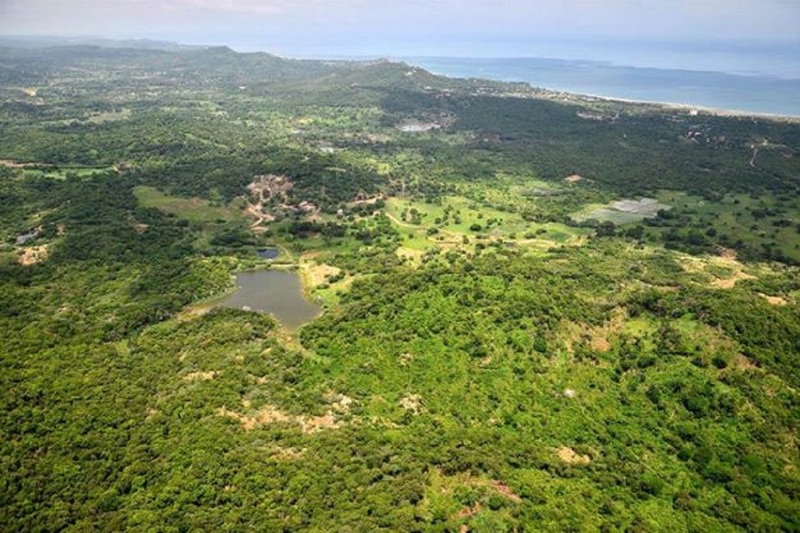 The location is well opened at 360 degrees and has a special slope in the valley right towards Stateside. 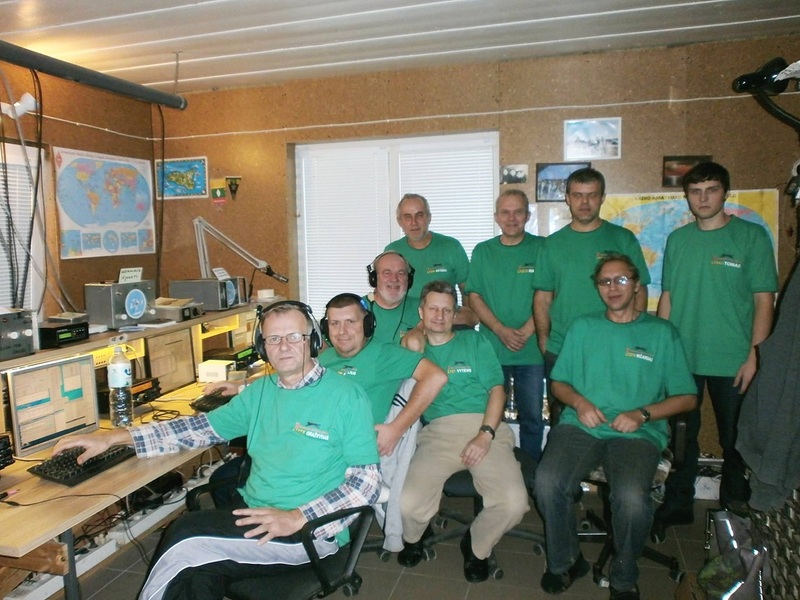 The club station is operated by the members of the Ilmenau Contest Club and friends. 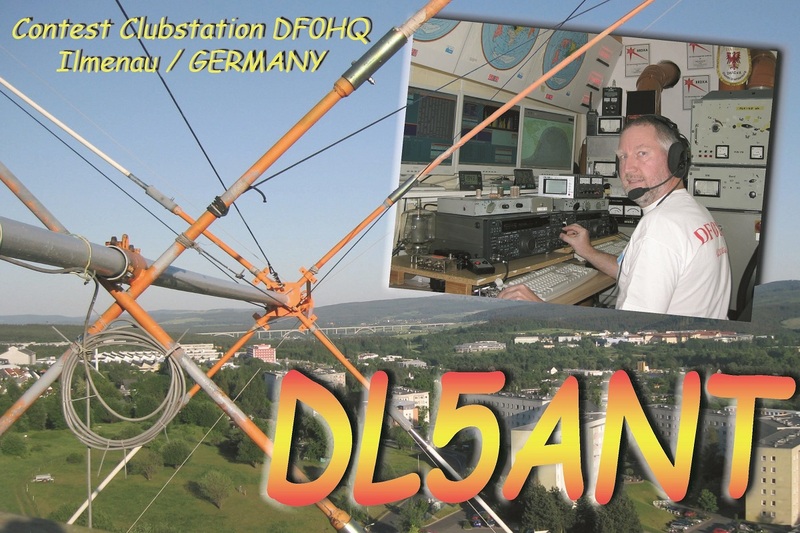 As DARC members we have the DOK “X34 TU Ilmenau”. The name shows our background of the technical university. 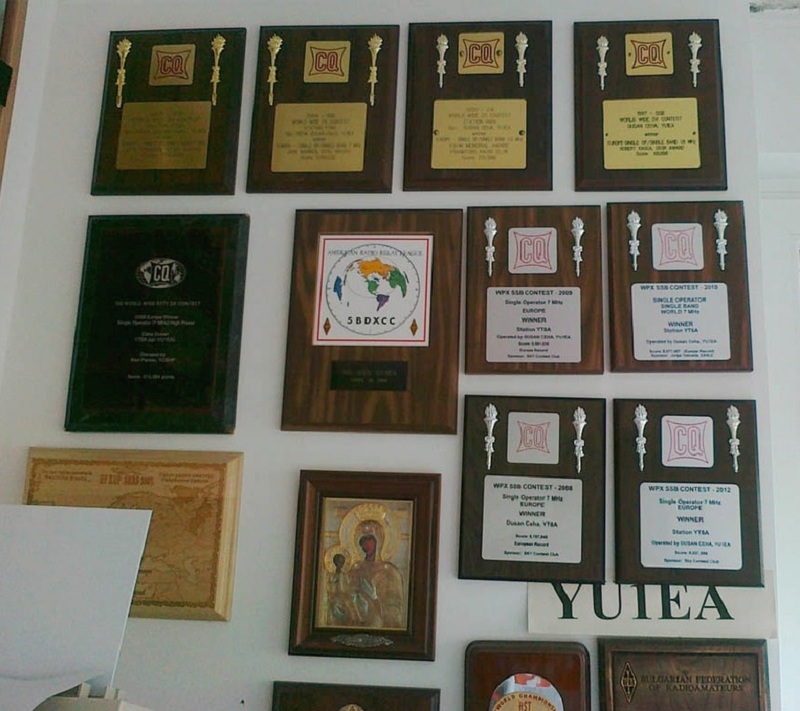 We have several plaques on the wall showing the long history of contesting and top results. 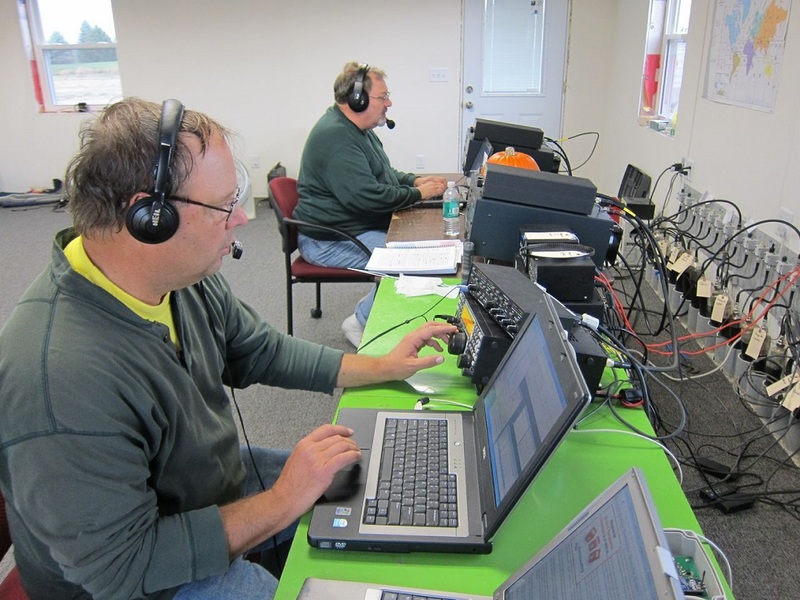 Once a year we invite interested people to see what we are doing and what are the main facts about ham radio. Newcomers and guests are always welcome. The landscape from the top of the tower is very impressive: towards North America there is a downhill slope of 400m in a 300m distance with incredible signals from that direction. 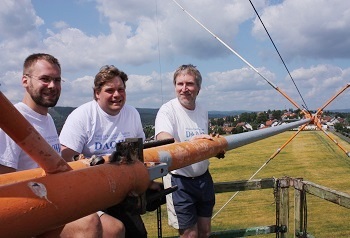 There is always much work to do on the antennas after the winter season. The main problem is ice at the wires and glass fiber elements due to ice rain or freezing fog. The station is located about 45 km from Belgrade. Me and my friend and neighbour Ivan-YU1LA are using this location only for contesting. 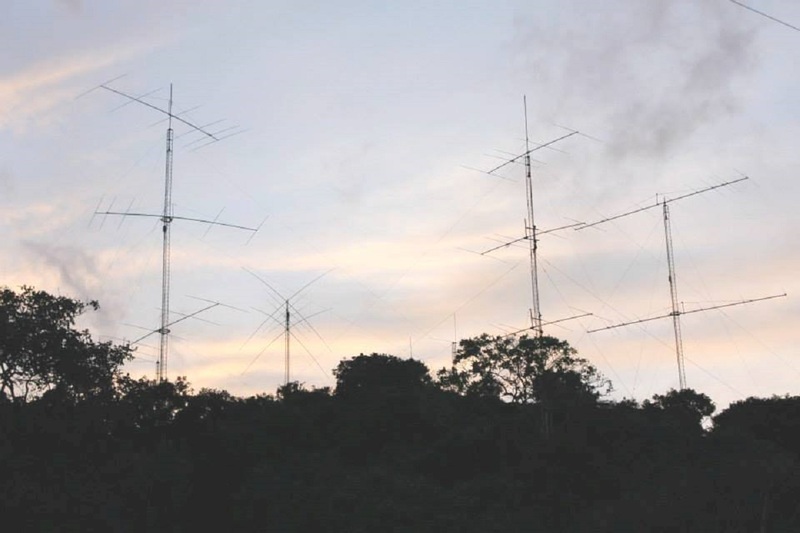 There is a field of different kinds of HF antennas such as verticals, log periodics, rombics and some wire antennas: beverage for USA, beverage for Japan, beverage for Brasil (all 380m long). My favourite category is SOSB 40m HP, sometimes SOAB HP. 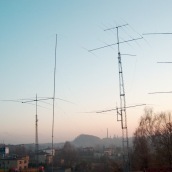 The most favorable bands are 40m, 80m and 160m but I have the best results on 40m. The set up is: Kenwood TS-590+TS-2000, OM-2500+SB-220, M-box (SO-2R). Software: N1MM, Win test and Mixwin. 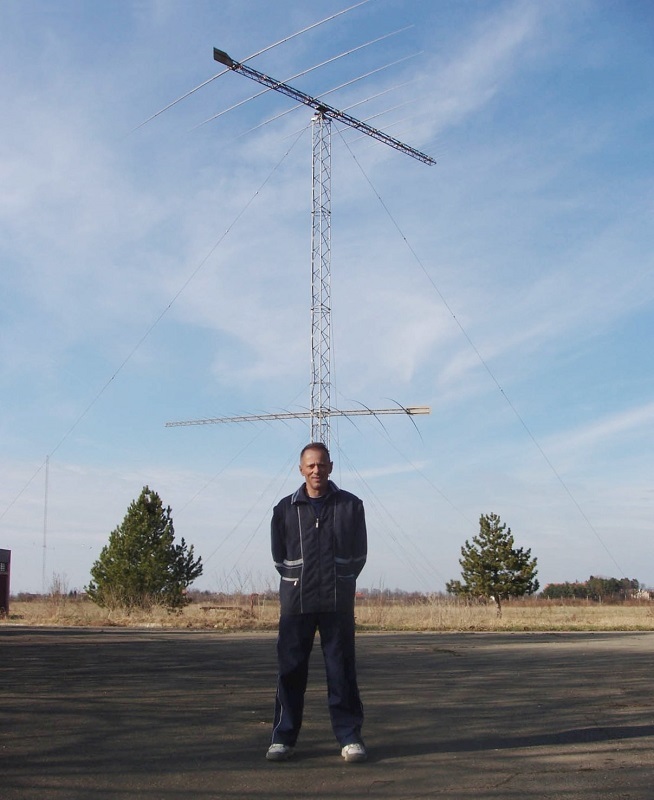 LY2W is the personal callsign of Arturas Snipas (ex-UP2BGF, LY2GF). 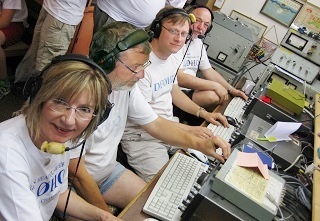 You can find this call on all bands during the major contests of the year: CQ WW DX Contest, CQ WW WPX Contest. For these contests a Multi-Operator team is usually organized, mostly in the Multi-Two category. The quantity of operators varies from 5 to 12, depending on people available. 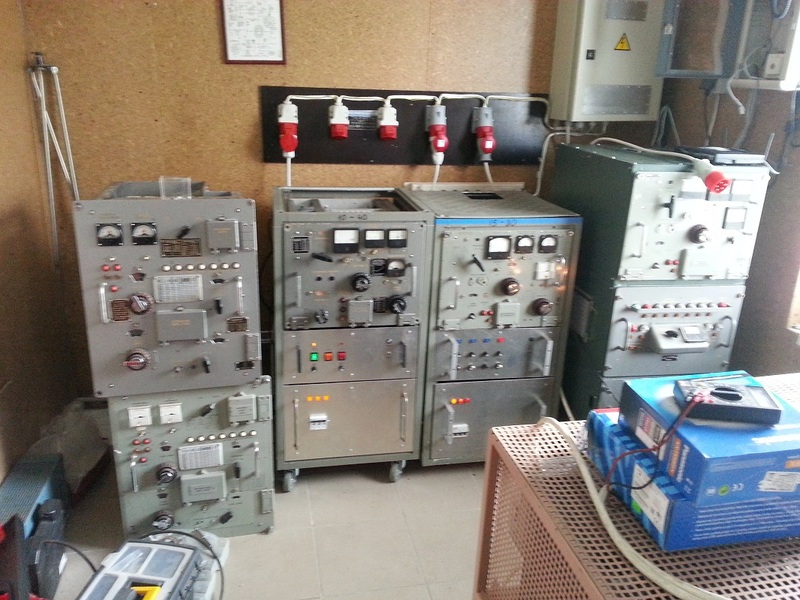 All Power Amplfiers are homemade, basically they are constructed from surplus Red Army military equipment. Usually we use 3 Kenwood TS-590s, the software used is N1MM or Wintest. 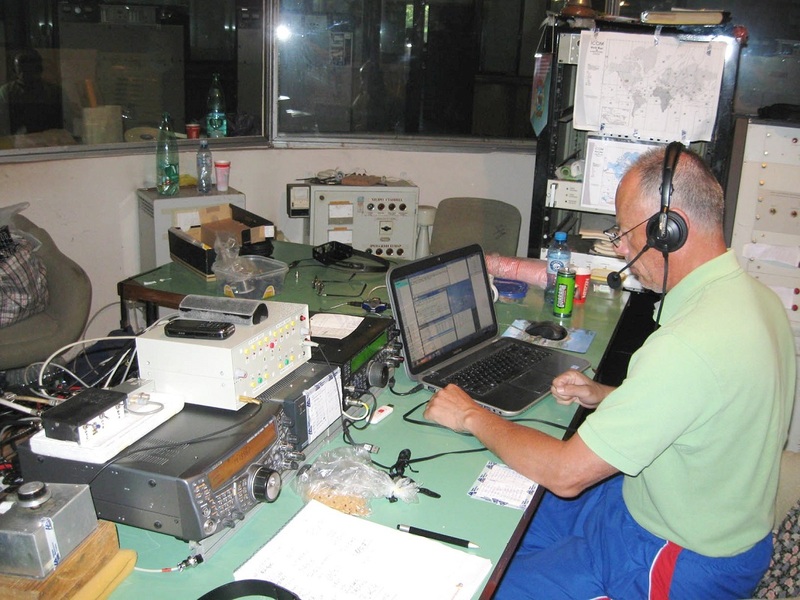 Since I started in HAM radio in the early 80´s the activity that interested me the most were the contests. 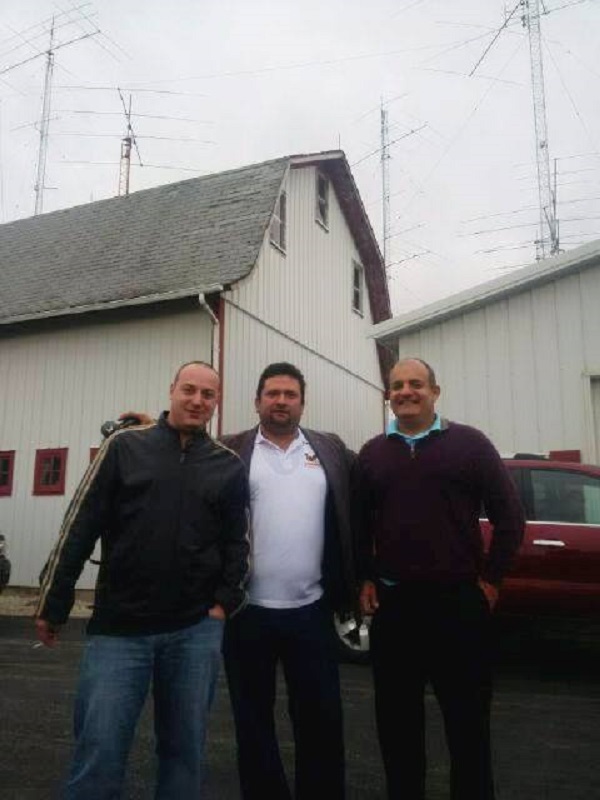 Ham radio contesting in Colombia has taken a huge step forward in the last 4 years. 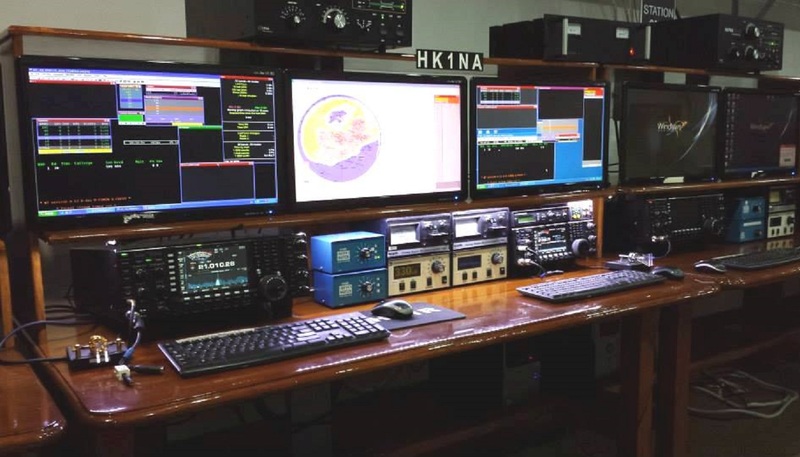 Many Colombian amateur radio enthusiasts, sometimes encouraged by some foreign ham operators, made timid appearances in various competitions and categories with the only intention to participate and not winning. In 1987 with my original call HK1KYR I decided to actually compete in a big contest and win it. 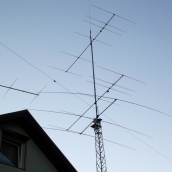 I had my eye on the ARRL DX CW, I operated in the SOSB 15 meter category, my goal was to be the best world wide, I installed a 5 element antenna for that band and achieved my goal, 1st place worldwide. For the first time a HK station won first place in a big contest. 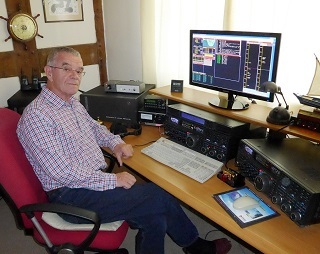 After 1988, my job, new responsibilities and other hobbies reduced my activity in Ham Radio. 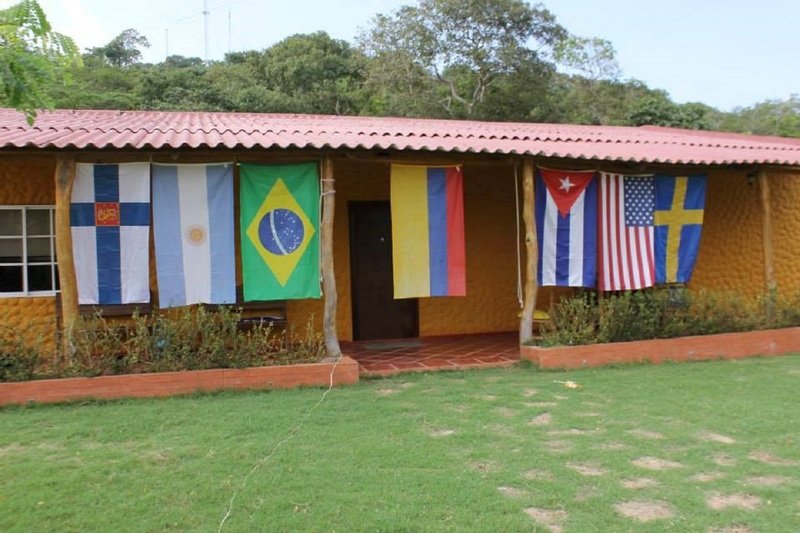 Colombia is a country that has been the victim of violent situations; this made it difficult to install a station out in the rural areas around the end of the 80´s and 90´s because we felt safer in the big cities. In 2004 things started to change and year after year safety increased and Colombians started to enjoy several things that had been impossible in the past. 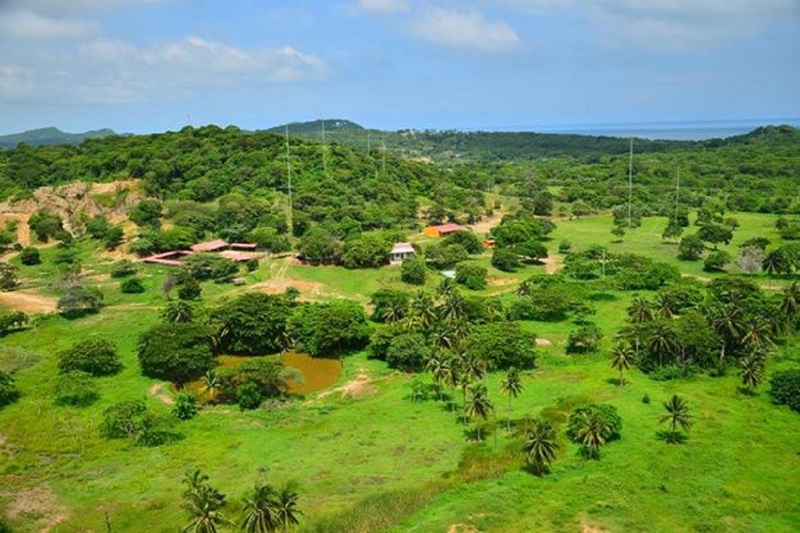 Finally in 2010 with the security issues behind us, a group of old ham friends decided to build a world class contest station on a 400 acre property located between Cartagena and Barranquilla, just 2 kilometers from the Caribbean sea. None of us had previous experience to design and build a project of this magnitude. When we started this adventure, it wasn´t only to build towers and antennas, it also included preparing and training to operate this type of station with efficiency and professionalism. This is how we started to build HK1NA. Today, after 4 years of continuous improving, the station has six operating positions, one per band. 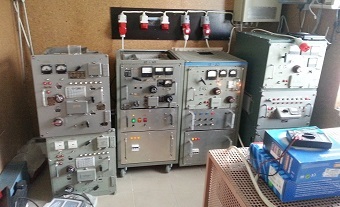 Each position is equipped for 2O2R (Two operators Two radios). Usually per band we have an ICOM7700 Radio and, as a second radio, an ICOM 7600. The amplifiers that we use are the Alpha 8410. 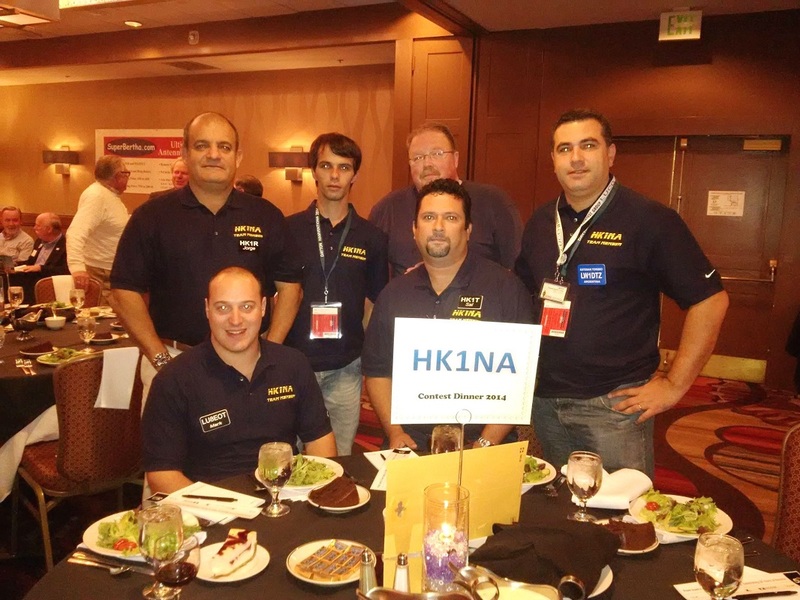 Since the beginning of the HK1NA station we have received the visit of many radio amateurs from around the world (contesters and DXers), we have learned so much from each visit and enjoyed every single one of them. My interest in contests goes back some forty years. With a modest station in a suburban location, I was able to win, or almost win, some of the RSGB contests of those days. But of course, things have changed. 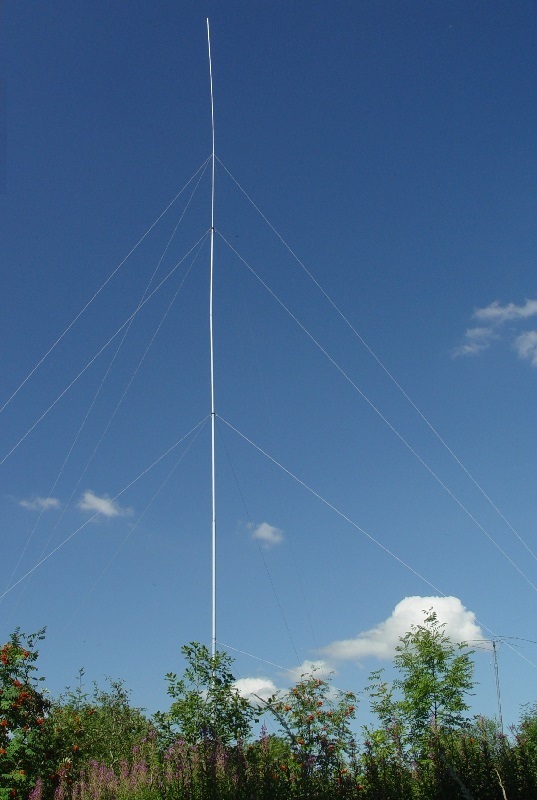 Over those forty years, beam antennas have become the “norm”, towers are much more easily obtained and big linears are commonplace. And so my contesting aspirations changed as well. 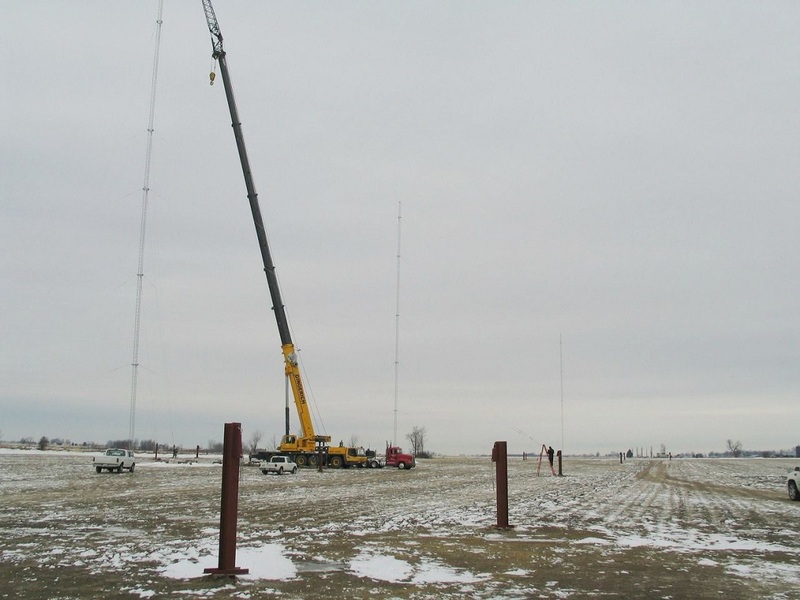 Initially there was only one tower and beam, backed up with dipoles and verticals. Even then, we began to feature in leading positions in the UK in multi-operator categories. But work at the salt mine prevented any serious optimisation of the station and it all took a back seat until I was able to retire some fourteen years ago. We then took a decision to have a lifestyle change, and move to the country. We moved out of the South-East of England, and bought a house on the border of England and Wales, on a windy hilltop near a small hamlet called Woolston, in the county of Shropshire. Shropshire is one of the less developed areas of England and the Southern part, where we now live, is mainly hilly and given over to sheep farming. It is a particularly pretty part of England, and the house we bought is in an “Area of Outstanding Natural Beauty” – a landscape categorisation which means that planning (zoning) laws are more stringent than elsewhere. 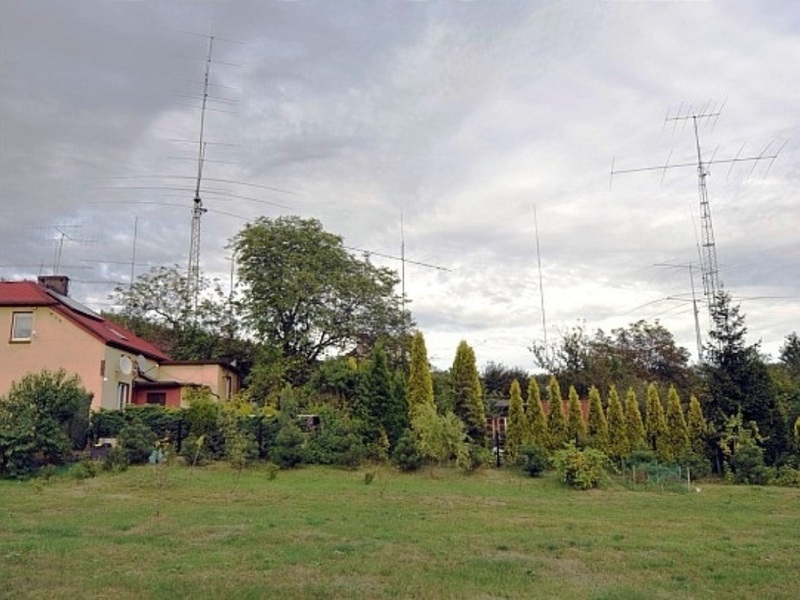 Given that one of the reasons for moving to the country was to develop the radio station an antenna farm, I took care to discuss my intentions with the local planners. After a short while in the discussion, the officer I met said “Ah yes…..amateur radio – we’ve had one or two of those before. But you take the towers with you when you move, don’t you?” I confirmed that I would not leave them after we moved on. “Oh well, I don’t see a problem” was the response. Good news indeed, for in parts of the UK, other amateurs have great problems gaining approval for even modest antennas. And so the slow process started of rebuilding the station at the new location. By US and other standards, it remains modest. 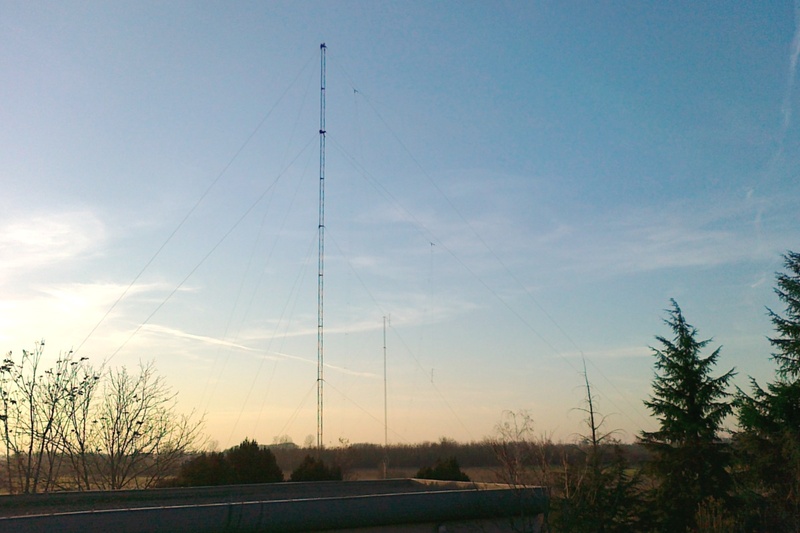 The main tower is 80ft, with a ten element Force 12 yagi for 40-10. 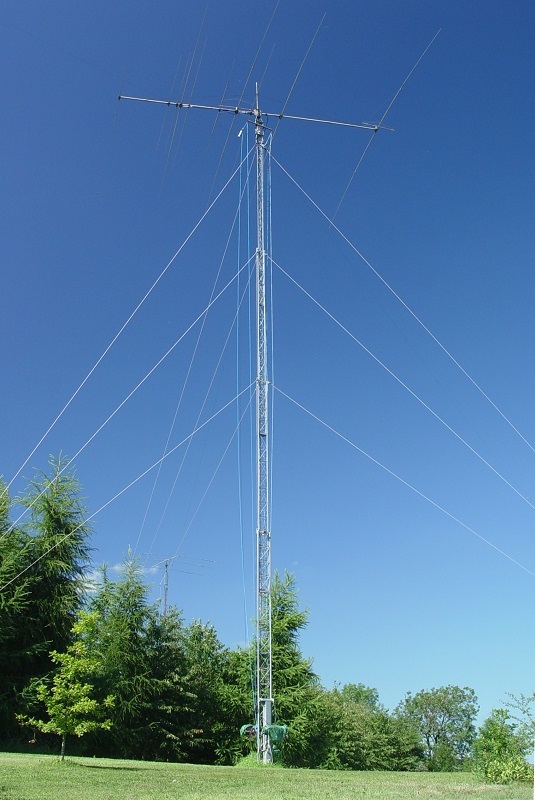 That tower also supports the centre of 80 and 160m dipoles. 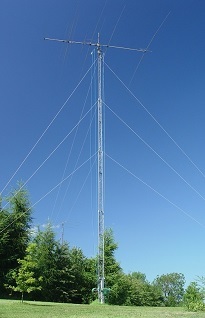 A Titanex 90ft vertical provides some capability on 160, 80 and 40. 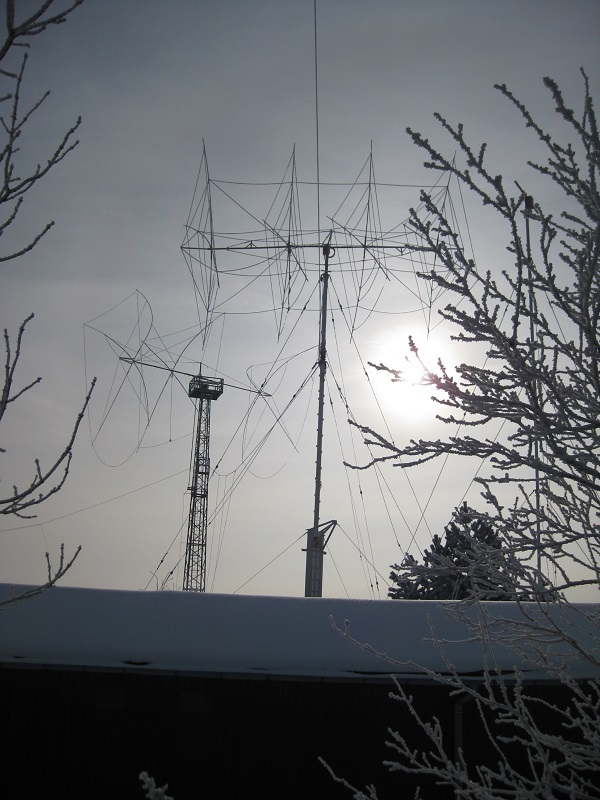 And a second tower with a SteppIR at 60ft gives a second HF capability. Both towers are on the top edge of a downward slope, in the direction of the US. This appears to give a pleasingly low angle in that direction. All antennas have to have high wind tolerance – 90 mph (145 kph) is not an unknown wind strength here. 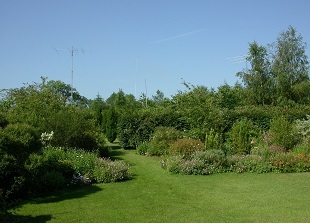 For LF receive, I started with a K9AY steerable loop, but have since added two beverages, the whole receive antenna system being fitted with 80 and 160m bandpass filters and preamplifiers, so that when operating multi single, the receive antennas can be shared with no interaction problems from the other transmitter. I should say at this stage that we live in a very low noise environment. Because of the AONB categorisation, there are no overhead high voltage lines, and electrical noise is (almost) unheard of. A couple of instances when the local low voltage power line developed a fault were quickly cleared by the power company, who seem very keen to help. Of course it would be nice to have a really big tower – say 150ft. But the AONB restrictions would then kick in, I feel, and also there are access issues for a big crane. So I am happy with the current installation, although I do have a 100ft tower lying in sections in the long grass…..I wonder? 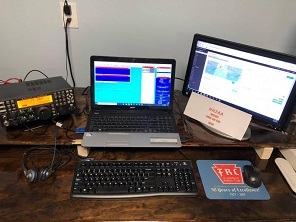 For RF equipment, I use two FTdx5000 transceivers, normally configured for SO2R, but easily re-set for multi-single or M2.The transceivers drive two linears – both auto-tuned. There is a Microham SO2R controller and of course auto-switched bandpass filters on each transceiver. All antenna selection is automatic, although I have an unusual arrangement with the two feed lines to the antenna field. I have two LDF feeds to remote switches. Let’s call them line A and line B. Line B: 10-20m SteppIR yagi, 90ft Titanex for 40-80-160 with a big earth mat. The unusual aspect is that I can switch lines A and B between transceiver/linear 1 or 2. Whilst this may sound strange, in fact it offers great flexibility. All band data and filters/antennas change in accordance with the band in use, so the A-B changeover is seamless. For MS or M2 contests, I can add a third work station using an Elecraft K3 (which I normally use for globe-trotting) and KPA500 linear, into whatever antenna seems sensible for what will be a multiplier spotting station. Normally I erect a simple vertical for one or more bands. I have several networked computers running Win-Test, a program that has never let me down. I evaluated a number of contest logging programmes some years ago, and decided that Win-Test with its bomb-proof networking, was the one for me. I’ve not regretted that decision. In multi-op contests, we’re connected to RBN and cluster, of course, and I also run a local skimmer here. Hilary, who shares my life with me, is also licensed (G4JKS) and so I am fortunate in getting great support from her when the house gets filled with contesters for one of the “big ones”. I still get a real kick out of operating in contests. Whilst this far north in Europe will never get a top place in the big contests, I do like to try to perform well against others at these latitudes.